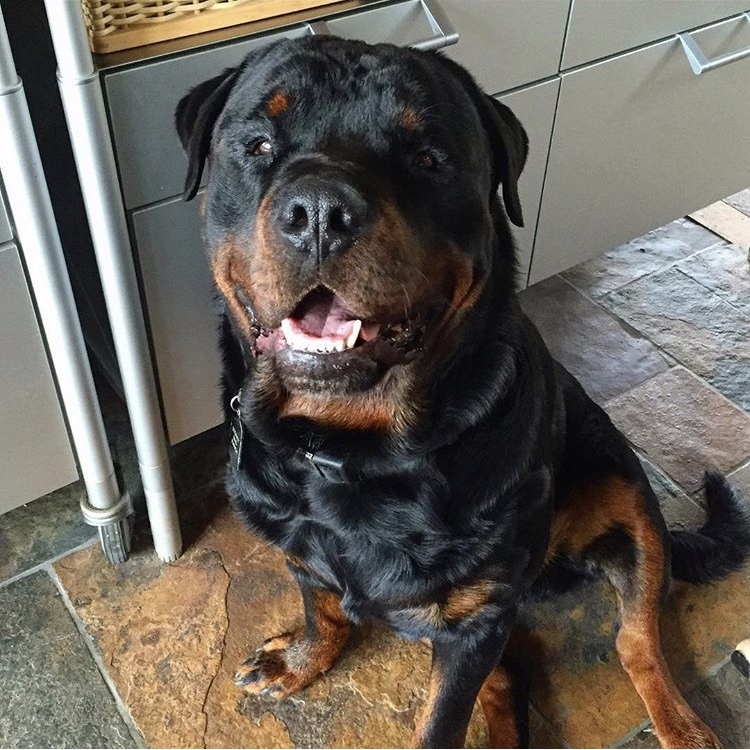 Most people look at Rocco and think that he's a scary-looking German Rottweiler but, to me, he's a wonderful person. I love him so much. We got him four years ago when I first moved to the ranch in Three Rivers. For whatever reason, even though I've never had one before, it was in my heart to have a German Rottweiler. I'd read that they were courageous, intelligent and expressive–and also incredible protectors, which was important to me because we were living so remotely. The breeder selected him for us based off an interview over the phone. I thought that when we got there we'd get our pick of the litter, but instead we were asked to be seated in the office as they carried him out to us–a little furball with giant paws, awkwardly stumbling around. Unlike your typical hyper and yappy puppy, he was as quiet as a church mouse. We still call him "the Buddha puppy" because he's been nothing but calm, conscious and contemplative ever since that first day. In fact, everyone is always surprised by how quiet he is. You'd almost think he was mute! He began talking only recently and only when he's in the car and knows we're going to the beach. He starts whining, as if to say: "Hurry, Mommy! I want to run around and play!" He sincerely believes that he is a human being. If there's a low chair around, he'll sit on that instead of the floor. And if I'm sitting on the floor, he'll sit on my lap. Sometimes he just wants me to hold his hand and give it a squeeze. His inner body clock is amazingly punctual. He always comes to me at six o'clock, on the dot, to let me know that it's dinnertime. Sometimes he appears at 5:55 p.m. to give me friendly reminders. When I take him down to the bay, he gets in the water on his own and paddles around for pleasure. He has a mind of his own but is also an obedient listener when he feels like it–usually when there's a treat involved. Like an only child, he constantly pines for attention. He'll sit at my feet and blink his eyes until I acknowledge him. If I purposely ignore him, he'll start huffing and stomping around. He watches me cook in the kitchen and asks me to show him what I'm chopping by lightly pushing my leg with his paw. Even if it's a clove of garlic, he wants to have a sniff. He's very observant and engaged. He likes to follow my boyfriend around the property to help with whatever he can. If my boyfriend is digging up something from the ground, Rocco will start digging too. If my boyfriend is pulling up something, Rocco will find something to pull up too. Rocco's presence is an absolute joy to have around. He makes me laugh so much. I talk to him as I would with any other person and he responds in his own way. I can't imagine my life without him. Sometimes the thought of one day losing him creeps in and I feel a pang in my heart. He's my little darling. I realized I haven't mentioned him yet on this blog and that's just a travesty because he's such a big part of my life! So, now you know about Rocco!